It is perfectly naturally to feel impatient, angry, or irritable at times, but it is also important to know how to cope with these emotions. There are specific times in a woman's life in which these mood swings are more likely - such as at certain points of the menstrual cycle, during pregnancy, and throughout menopause. As well as this, though, impatience, anger, and irritability can be instigated by external stresses and the pressures of everyday life. Whatever the reason, learning methods for dealing with such feelings is helpful for your general well-being and your loved ones. Depending on individual temperament, some women struggle with handling their anger to such an extent that it can be damaging to their relationships. If you feel that you are excessively irritable and angry, there are a few actions you can take. Mind-calming exercises. Practicing meditation or ensuring you have adequate time for relaxation can be helpful for achieving a calmer demeanor overall. Counting from one to ten. This is a well-known technique for controlling anger in the heat of the moment. Breathe slowly while you count from one to ten, and in doing so, you will divert your mind somewhat. Repeating a buzz-phrase. Reciting a short, comforting phrase such as “keep calm”, or “take it easy” can be beneficial for keeping yourself composed. Try to take time to think about things from another point of view, thereby possibly enabling yourself to understand the reasons behind the other person's behavior. Acknowledge that your feeling irritable has an impact on your reactions in general. Being self-aware in this way will help you to consider that your first response may not be the right one. 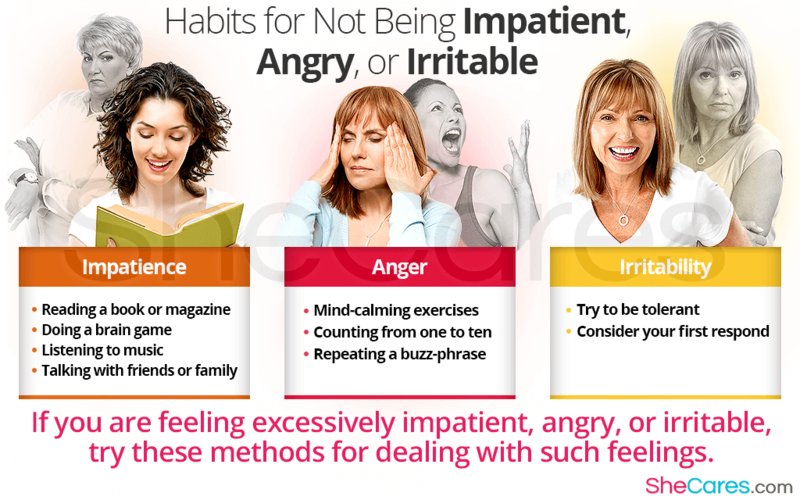 If you are struggling with feeling impatient, angry, or irritable, it can be equally frustrating for you and your loved ones. Most people will be affronted with these emotions at some stage while dealing with the challenges of day-to-day life. Self-awareness and knowledge about the causes of these feelings are crucial for ensuring they do not damage your relationships or negatively impact other aspects of your life. Learn more about the possible causes of irritability.